Remembering the greatest American, George Washington, on his birthday, I urge you to read (here) William J. Federer’s “American Minute” for Feb. 22, 2009, honoring the Father Of Our Country, who was “First in war, first in peace, first in the hearts of his countrymen” to his American revolutionary contemporaries (as Henry “Light Horse Harry” Lee said); who was regarded internationally as “the greatest man of our own or any age,” as expressed by England’s Lord Brougham; and about whom Thomas Jefferson wrote: “It may be truly said, that never did nature and fortune combine more perfectly to make a man great, and to place him in the same constellation with whatever worthies have merited from man an everlasting remembrance. While Washington’s contributions to American liberty as soldier, statesman, and president, are unequaled, his greatness was perhaps most magnificently evidenced not with what he did with power, but what Washington did in walking away from power and returning home at the end of his term as our First President, even though his countrymen urged him to a third term and offered him power for life, even as a “king.” In him, honor, true nobility, resided. Would that such character was possessed by those who would rule us today, instead of leading lives lusting after power, apparently at any price of integrity. Would that we, each of us, the governed, had the character of Washington, to defend liberty and stand against tyranny, whatever its source, at any price, as did he, Washington, the father of our freedom. 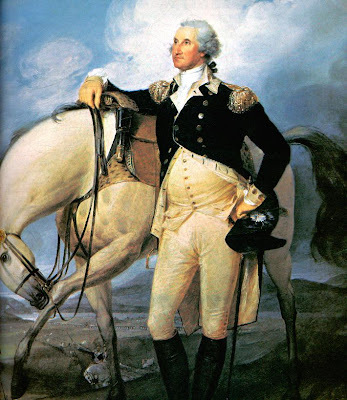 I thank William J. Federer, author of “America’s God And Country; An Encylopedia of Quotations,” and so many other patriotic books, for his American Minute tribute to George Washington, helping us, Washington’s heirs to freedom, to join in the “everlasting remembrance” of George Washington to which Jefferson called us more than 200 years ago.